Your camping supplies will drive off into the sunset safely with these roof carriers. A road trip or camping excursion for us means the family vehicle is packed to the gills with supplies, forcing us to make the tough choice about what we take and leave behind. It seems like no matter how large our vehicles are, there is never enough space for everything we want to pack. One solution is to go out and buy a vehicle with more cargo room. 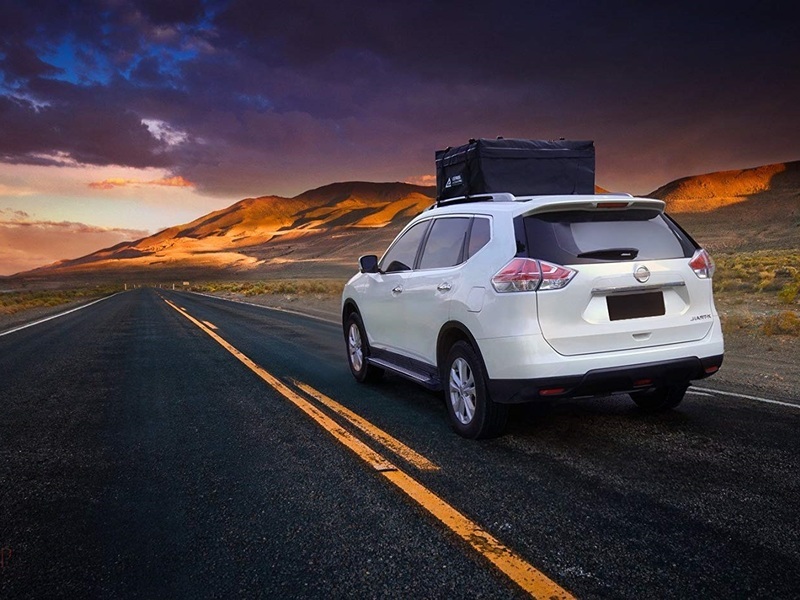 If you're not ready to fork up $30,000 quite yet, a simple and much less expensive alternative is to add cargo space on top of your vehicle via a roof cargo carrier. These four waterproof carriers won't compromise passenger room and will keep your items protected no matter what adventures you embark on. This spacious cargo carrier from Leader Accessories ($50.00) will fit tons of camping gear in its 15 cubic feet of space. The soft shell material will be flexible enough to stretch and fit around even the more awkwardly shaped items. This cargo bag is waterproof and resistant to dirt, sun, and wind so when you get caught in a rainstorm on your way to the campsite, there's no need to worry about wet sleeping bags when you arrive. Included with the Leader Accessories cargo bag is an anti-slip mat which has webbing to prevent the cargo bag from sliding around the roof even in wind or highway driving. This carrier can be easily installed on any standard roof rack with four included straps. Got too much junk in the trunk? The JEGS Performance Rooftop Cargo Carrier ($180) is your answer. It has a massive capacity of 18 cubic feet and is also the most affordable hard shell carrier available on Amazon. With dimensions of 57" L x 39" W x 19" H, it will protect any prized possessions you entrust it to on your cross-country road trip. Installing the cargo carrier can be done by one person with no tools required to install or remove. It works on cross rail systems rated at 150+ lbs. The mounting hardware and two keys are included to install and secure the carrier. Additional reasons to buy are that it is made in America and comes with a lifetime guarantee. This rooftop cargo carrier is a "Keeper" in more ways than one.The Keeper Waterproof Rooftop Bag ($54) is made out of rubber laminated nylon and is designed to protect your most valuable outdoor adventure gear from rain, sun, and dirt. It holds a generous 15 cubic feet of cargo and measures 44” x 34” x 17”. Installation is as simple as buckling the included straps around your roof rack to secure the carrier. It will stay put even at highway speeds and when you return home, it can be folded up to a compact size for easy storage. No roof rails? No problem. The versatile RoofBag Cargo Carrier ($69) can be installed on crossbars, side rails or just on a bare roof. This USA-made carrier can be used on any vehicle whether a sedan, SUV or van. The heavy-duty, waterproof bag can come in 11 cubic feet or 15 cubic feet and attaches to your roof with the included seatbelt-style straps. If you don't have racks on your vehicle, simply pass the staps through the inside of the car through the door frame and the doors will close over the straps. Choose size 11 for smaller vehicles and size 15 for full-size sedans, SUVs or vans. No matter the speed you're traveling, the Roofbag won't budge, giving you confidence that your gear will arrive at your final destination unharmed.